Fujifilm saved one of the most surprising announcements of Photokina 2018 until the very end of their conference: the news that global megastar Taylor Swift has been helping them design two new Instax SQUARE SQ6 products. The Instax SQUARE SQ6 Taylor Swift Edition and Instax SQUARE Film Taylor Swift Edition have - according to Fujifilm - both been "designed personally by Taylor Swift herself", and will launch on October 20th. 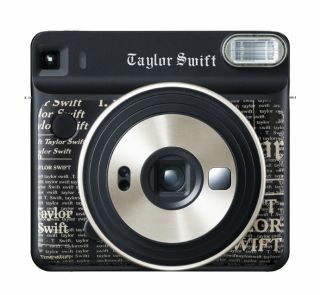 The Instax SQUARE SQ6 Taylor Swift Edition features a gold newspaper design on a black base, with Taylor Swift's autograph printed on the back of the body. It comes with a Taylor Swift-branded camera strap and film case. Given the pop stars credentials, we reckon this camera will end up in our best cameras for kids guide soon. The Instax SQUARE Film Taylor Swift Edition features a print of Taylor Swift's autograph on a black frame, and will be released alongside the camera. The announcement was accompanied by a series of video snippets in which the star explained her love for the format as she filmed a commercial to promote the partnership. As well as the predominantly black and gold Taylor Swift-designed models, Fujifilm also announced a pair of new colours in the Instax SQUARE SQ6 range: Ruby Red and Aqua Blue. The Instax range has been a phenomenal success, with 10m units projected to be sold worldwide in 2018, and 30m units sold in total worldwide since its launch in 2014.